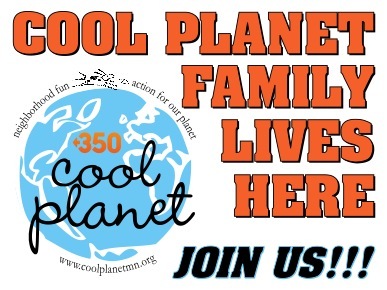 Registration is now open for our Cool Planet Family Lives Here class with Minneapolis Community Education. In our two-session Community Education course: Families learn how to use a kill-a-watt meter, about home energy audits, how to read energy bills and the importance of individual actions. Participants check out kill-a-watt meters for home use, sign up and receive home energy audits (through CEE), create a second-chance paper box, complete a Cool Planet Family Action Plan and earn a Cool Planet Family Lives Here yard sign. Yard sign tells neighbors about program, positive experience causes them to tell others about program so others engage in next opportunity. Cool Planet aims to engage people of all ages in taking action for a healthier planet. To become a “deeper shade of green,” participants (students and families) look at their own energy consumption, waste reduction habits, personal fitness and active citizenship. 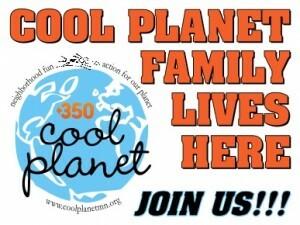 The “Cool Planet Family Lives Here” yard signs fit the Edina culture where neighbors follow the leader with cars, sports, homes and now earth friendly living (creating a new social norm). This project is a core program of our organization.